I came to the States when I was 19 years old in 1988. I am married to an Army Service Member and Mom to 3 big pups. 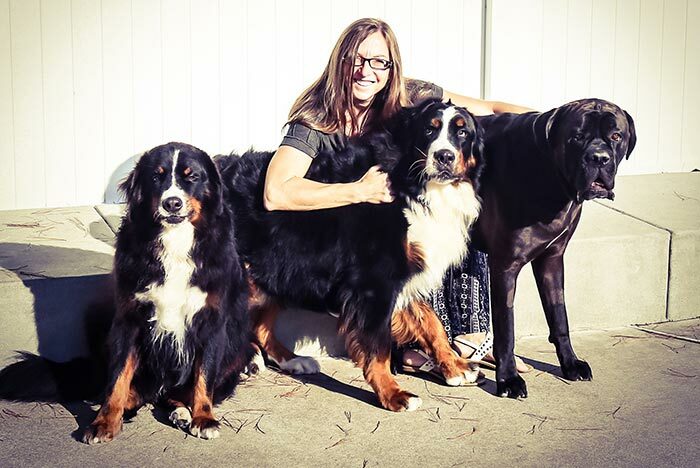 I am lucky to be owned by two Bernese Mountain Dogs (Brodie and Tolstoy), and a Cane Corso (Gunner), whom are my absolute loves and faithful friends. I was born in a family of Artists. My father was an amazing painter and writer with his passion being landscape design. My brother was an architect that specialized in interior design, and my Mother did magnificent embroidery. By virtue of my family environment, I felt a natural vibe to be artistic at a very young age and with no training at all I started developing my own style. I used pencil drawings as a means to convey my feelings on paper, when I wasn’t able to express myself in my teenage years. When I moved to the States, as my family was still in Italy, I used to draw the faces of my loved ones, as drawing them somehow helped me engrave the details of them in my memory. As I progressed I realized that photography was what I gravitated toward, I felt it was my calling. Most of my photos are in black and white as they remind me of pencil drawings, which retrospectively brings me back to how my interest in art began. A photo helps me connect with the subject and my most favorite shots are not the posed ones but the ones that reflect someone’s true emotions and feelings, in being candid. Even on posed photos, I will focus on a detail that speaks to me. I love to surround myself with anything artistic; whether it is in my father’s paintings, my Brother’s sketches of a beautiful home or an art piece from an up and coming artist that I found while visiting an art fair. Photography is a passion. I see art in anything that surrounds us. It is merely how it is captured that makes the difference, the emotions it can evoke, and how it can be interpreted by anyone looking at it. I hope that anyone looking at my work can see what I see, and the emotional connection I have with the subjects I am fortunate to photograph. I have been grateful to have to opportunity to work with several rescues and shelters, such Orange County Pit Bull Rescue, Bullies and Buddies and Seal Beach Animal Care Center, and photograph some of the extraordinary pups that are being fostered and are waiting for their forever home. It all started when I met the founder of Orange County Pit Bull Rescue at the vet the day she brought in little Violet, barely holding on to her life. Faith will have it that our paths would cross and that is how the relationship began. Little Violet brought us together. From that moment on, every time I have the opportunity to photograph these beautiful souls and look into their eyes, it is as though they are telling me a story, their story. And if I can capture just a moment where everyone can see and share their story and open up their home to some of them and give them the love they so deserve, than what I do in volunteering for these organizations makes it all worth it.